What Exhibitors are at the Expo and what are they offering at the Expo? David Wilson profiles the companies and colleges who will exhibit at the Expo and looks over what each company will be offering. Devenish develops and supplies quality nutrition products and solutions, new technologies and distinctive customer support to the agri-food sector. It is heavily invested in research and development which allows it to provide solutions to current and future problems. With its headquarters in Belfast, Devenish operates right across the UK, Ireland, and the USA just to name a few. Devenish is delighted to be recruiting its largest ever intake of graduates to join the company in 2019. The new Devenish Professional Graduate Programme will recruit capable graduates to specialise in one of four sectors: business services; commercial operations; technical and nutrition. As Ireland’s No 1 choice for agri-food career development, UCD Smurfit Executive Development has been designing and delivering internationally renowned masters programmes in partnership with Bord Bia since 2009. It is located within the UCD Michael Smurfit Graduate Business School in Blackrock and recent and experienced graduates are now invited to apply for one of 70 Bord Bia scholarships. It has a depth of expertise in food and agribusiness, and has long established partnerships with world renowned faculty who specialise in the food industry from business schools including Harvard, MIT Sloan, IMD, Oxford Saïd and New York Stern. Ornua is an agri-food commercial co-op which markets and sells dairy products on behalf of its members – Irish dairy farmers and processors. It is Ireland’s largest exporter of Irish dairy products, exporting to around 110 countries worldwide. Headquartered in Dublin, it has annualised sales of over €2bn and has a global team in excess of 2,000. It operates from 19 business units worldwide, including 14 production facilities, and has sales and marketing teams working in-market across the globe. Ornua has 24 job opportunities, based in Ireland, the US and the UK. Agritech is a family owned business that manufactures and supplies a range of forage and nutritional products to livestock farmers in Ireland. They produce a variety of products including grass seed, feed additives and mineral supplements. The Nenagh-based company continuously invests in research, product development and improving manufacturing technology. They currently operate in over 23 countries worldwide. Agritech are seeking to directly employ full-time sales advisers and product distributors on a self-employed basis at the event. The jobs will be based in west Cork, Meath, Louth, Galway, Donegal, Down, Antrim, Derry and Tyrone. Arrabawn is a dairy co-operative with over 100 years’ experience, operating across three provinces. Having undertaken a recent investment, it is operating one of Ireland’s most modern dairy processing facilities. Headquartered in Nenagh, Co Tipperary, the company has a turnover in excess of €240m and employs more than 400 people in areas including production, quality, environment, purchasing, sales, marketing, human resources, research and development, finance and administration. The company is recruiting 15 jobs in management, quality, graduate, sales, retail, electrician (apprentice), lab technicians, marketing, communications and distribution. It is also accepting CVs for future job vacancies. Aurivo is one of Ireland’s leading multipurpose co-operatives with businesses in consumer foods, dairy ingredients, agribusiness and livestock marts. Its consumer foods business comprises of a range of milk, butter and nutrition brands, such as Connacht Gold, while the dairy ingredients operation produces and exports enriched milk powders and bulk butters. In addition, Aurivo has a growing agribusiness division, which includes 34 homeland retail stores and garden centres, an animal feed business and four livestock marts. Aurivo has eight jobs up for grabs at the careers expo including trainee managers, trainee commercial specialists and four graduate places. Bord Bia markets and promotes Irish food, drink and horticulture in Ireland and around the globe. It works alongside farmers, processors and agribusinesses to support the growth of the sector. Using its market expertise, consumer insights and a network of 13 overseas offices, Bord Bia plays a major role in the success of the industry. It is hiring 11 people to work domestically and abroad across management, business and marketing and communications. In addition, it has 70 scholarship places in its talent academy, which offers students a fully paid third-level masters qualification from Smurfit Business School. Claas is a German agricultural machinery manufacturer that specialises in the production of tractors, agricultural balers and green harvesting machinery for European and World markets. With over 11,000 employees worldwide, Claas is one of the biggest manufacturers of machines for the agricultural sector. They are located right across Europe, Asia, North America and South America, giving Claas employees a wide range of career opportunities. Claas is looking to fill a number of roles at the Expo including a service engineer, a store parts assistant, a sales trainer as well as apprenticeship and placement positions. Colm Quinn is a BMW retailer with bases in Athlone and Galway. The company’s retail centre showcases the latest new models, plus a wide choice of BMW premium selection approved used cars. Employing more than 100 staff, Colm Quinn himself has nearly 30 years’ experience in the car market in Ireland. The company will be looking for a junior sales executive, an experienced sales executive, an apprentice technician, a senior technician, an experienced service manager, a service adviser, a service administrator, a MINI manager, a CRM executive, a showroom host, a valetor and a parts adviser. The Department of Agriculture, Environment and Rural Affairs (DAERA) has responsibility for food, farming, environmental, fisheries, forestry and sustainability of the rural sector in Northern Ireland. It also oversees CAFRE, an NI-based ag college. With campuses in Enniskillen, Greenmount and Loughry, CAFRE caters for higher education in the agriculture, horticulture, veterinary, engineering, food, floristry and equine sectors. Dairygold is a dairy co-operative based in Mitchelstown in Co Cork. Located across Europe, it is Ireland’s largest co-operative. The co-operative remains focused on producing cheese and dairy ingredients that can be traced from grass fed cows in Ireland. The company is constantly adding value to its nutritional products through smart innovation, research, industry-leading technology and world-class facilities. Dawn Meats is one of Europe’s leading food processors, producing quality Irish beef and lamb products. It exports to more than 50 countries and is the supplier of choice to a range of supermarket, food service and restaurant businesses. Its Brighter Futures Graduate Programme aims to take on over 30 graduates for this year and applications close at the end of February, meaning the Expo will provide the perfect opportunity to scout the best talent. The roles available include accounting and finance, agriculture and livestock procurement, engineering, food safety and quality, health, safety and environmental, human resources, new product development, production and operations, sales and commercial. The Department of Agriculture, Food and the Marine employs more than 3,000 staff across the country. The Department also has staff working in Abu Dhabi, Beijing, Brussels, Geneva, London, Moscow, Paris, Rome and Washington. Its mission is to serve the Government and people of Ireland by leading, developing and regulating the agri-food sector, protecting public health and optimising social, economic and environmental benefits. Roles of veterinary inspectors, assistant agricultural inspector, general operatives, craftspersons and harbour masters are on offer in 2019, resulting in the recruitment of 50-60 people. You can apply for these jobs at the Expo. The Department of Employment Affairs and Social Protection runs Ireland’s welfare system. It oversees the provision of income support and other social services. 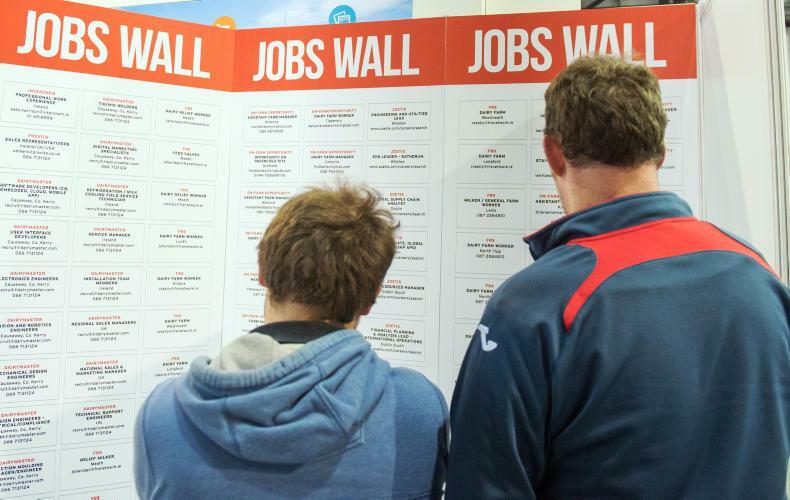 The department confirmed that more than 6,300 jobs across the country are advertised on JobIreland. All of the positions will be available to the public at this stand, where people can view the details and apply. Dundalk IT has over 45 full-time degree courses across the schools of Business and Humanities, Engineering, Informatics and Creative Arts and Health and Science. Students at DkIT are taught in a state-of-the-art “green” campus located halfway between Ireland’s two major cities, Dublin and Belfast. Also on offer at DkIT are more than 60 part-time courses across a broad range of subject areas. Dundalk IT collaborates with Teagasc at Ballyhaise Agricultural College to deliver degrees in agriculture in agri-food production. Enterprise Ireland is the Government organisation responsible for the development and growth of Irish enterprises, companies and organisations in world markets. They work in partnership with Irish enterprises to help them start, grow, innovate and win export sales across the globe. They will be taking on 150 graduates at the Expo. Education and Training Boards Ireland oversee the 16 regional boards across the country. They provide a range of educational services across post primary schools and colleges, apprenticeships and adult education and training. The ETBI is actively increasing opportunities and developing educational services. Educational and Training Boards throughout Ireland are also helping jobseekers upskill as well as find work, placements and traineeships. Farm Solutions provides staff such as herd managers, farm managers and general farm workers mainly to dairy farms but also place staff in tillage, pig, poultry and beef farms. Farm Solutions Ltd is a subsidiary of The Solutions Group, a farmer-owned co-operative set up in late 1970s. Farm Solutions is looking to recruit 31 farm workers across the country. Roles vary from farm managers, herdspersons, dairy milkers, stockpersons and general farm workers. FBD is the largest Irish-owned insurer, offering a wide range of protection products including car, home, van, business and farm insurance. FBD Insurance’s network of 34 branches, together with phone and online support teams, have been providing cover to Irish consumers, farmers and businesses for over 50 years. FBD continues to support Irish farmers through initiatives such as FBD Macra Young Farmer of the Year, FBD Farmyard of the Year, FBD Teagasc Student of the Year and The Paddy O’Keefe centre at Moorepark. FBD is recruiting for at least 14 jobs at the expo in the following areas: sales, commercial, claims, IT, branch managers, business development and more. Roles are based in Dublin, Navan, Galway, Cork, Mullingar and Thurles. The FRS Farm Relief Services, FRS Fencing and FRS Recruitment teams will be on hand at the Agri Careers Expo to give information about the various on-farm opportunities available around the country. They will also be promoting their upskilling farm training programmes, fencing jobs and agribusiness roles. Jobs on offer at the Agri Careers Expo include a mix of full-time, part-time, seasonal and permanent job opportunities in the agricultural sector. On the day, FRS will be looking to recruit 89 farm workers for their relief service, five full-time fencing operators, while FRS Recruitment are looking for up to 25 people for their agribusiness clients. Glanbia is a global nutrition company with operations across 130 countries. Glanbia employs over 6,600 people, with its major production facilities located in Ireland, the US, the UK, Germany and China. Additionally, Glanbia Ireland is the largest supplier of inputs to the Irish agri sector. Their 52 branches provide farmers with value and high-quality farm inputs. Glanbia has 65 Irish-based jobs open across the following sectors: accounting and finance, quality, sales, IT, technical services, management, research and development, business development, marketing, engineering, transportation, manufacturing, communications and legal and human resources. Galway-Mayo Institute of Technology provides a range of degree programmes in agriculture, food production and environmental management through its main Galway city campus and its Mountbellew campus. These include agricultural engineering, agriculture and environmental management, rural enterprise and agri-business. The Mountbellew campus hosts a 169ha farm and forestry which gives students an opportunity to gain practical experience as part of their programme. In addition, it also provides a diverse range of courses in all subjects. GMIT has a vibrant community of more than 6,700 students with over 70 clubs and societies. If you are interested in studying in GMIT, speak to their team at the Agri Careers Expo. Grassland Agro was established in 2013 after the merger between the French-owned business Timac and the Irish-owned Grassland Fertilizers. They have industrial fertiliser plants in Limerick, Cork and Slane, with the head office based in Ballymount in Dublin. Grassland Agro source, produce and sell a range of conventional commodity fertilisers as well as a range of fertiliser and soil conditioning products. In addition, they sell a full range of animal mineral blocks as well as biostimulants. They also supply products to agri merchants and co-ops through over 30 agronomy sales specialists, who visit farmers across Ireland every day. Harper Adams University is located in Shropshire, England, and is a specialist provider of higher education for the agricultural and rural sector. Set on a 635ha farm, Harper Adams is renowned for its highly innovative and rewarding courses for undergraduate, postgraduate and lifelong learners in agriculture based sectors. It boasts a 97% employment rate for its graduates and was awarded the 2017 University of the Year by WhatUni. If you are interested in a career or degree in agriculture, make sure to check out Harper Adams University at the Agri Careers Expo. ifac is an accounting firm for farmers and agri-food businesses. They work with businesses operating across four main sectors: farming; agribusiness, food and drink and renewable energy. They have branches in over 30 locations nationwide and employ 400 people. The company confirmed before Christmas that it is creating 200 jobs across the country in the agribusiness sector over the next three years. They will be recruiting for a range of roles at the Agri Careers Expo. Established in 1870, The Irish Field is Ireland’s only newspaper dedicated to racing and equestrian sports. Published every Saturday, the newspaper covers a host of topics including the latest racing news, interviews and features, international racing coverage, sales reports/previews, racecards, tips, show jumping and eventing coverage, and classified advertising. The Irish Farmers Journal is the largest selling farm and agricultural publication in Ireland or Britain with a weekly print readership of over 250,000 people. The Irish Farmers Journal provides weekly news, technical content, country life features, and market updates to the Irish agricultural industry and the families dependent on it. With a growing digital subscription base, the Irish Farmers Journal is seeking to hire a digital revenue strategist at the Expo. It is also hiring two interns for their editorial department. Institute of Technology Carlow is one of the largest technology colleges in Ireland, with campuses in Carlow, Wexford and Wicklow. It provides full- and part-time courses across a comprehensive portfolio of subjects. The college offers courses in sustainable farm management and agribusiness at level 6, level 7 and level 8. The courses are based in Wexford, with the latter containing a 24-week placement. Check out the IT Carlow stand for more information. Kepak Group is one of Europe’s leading food innovators which processes and markets a full range of meat proteins in varied formats and presentations. With over 50 years’ expertise in the market, it has built up highly successful international food brands. It employs about 2,700 people and has a presence in 43 countries. Kepak is seeking 20 graduates in operations, commercial, marketing, procurement, sales, human relations, health and safety, engineering, accounting, supply chain, and IT. Kepak is also looking to employ 30 plant operatives at the expo as well as hygiene officers, an international trader, a site manager, a business development executive and a health and safety coordinator. Kerry provides market-leading innovation in the food, beverage and pharmaceutical markets. It also manufactures and markets chilled food products and has an extensive agribusiness network. Based in Tralee, Kerry employs over 24,000 people in its manufacturing, sales, technology and application centres across Europe, North America, South America, Australia, New Zealand and Asian markets. Kerry is recruiting 350 people worldwide, as well as 90 in Ireland. The number of graduate places are not confirmed, but they took on 100 graduates last year. JFC group is a family-run, international business with its head office in Tuam, Co Galway. Its mission is to supply innovative product solutions across the divisions and markets that they serve. Their first product, the JFC Multi-Bucket Calf Feeder was launched on RTE’s The Late Late Show in 1987. Since then it has transferred its problem-solving skills across five market sectors including civils, diamond tools, agriculture, material handling and marine. With offices and production facilities in eight countries, we supply customers in over 40 international markets. They expect to turnover €100m by 2020 and employ 400 people. Liffey Meats is one of Ireland’s largest beef processors, employing over 350 people and with a turnover in excess of €150m. Based in Ballyjamesduff, Co Cavan, they supply high-quality beef right across Europe. Liffey Meats is recruiting 45 employees for its Ballyjamesduff plant. Roles include general operatives, supervisors, trimmers, safety officers, a food safety manager, a sales and marketing officer, a night production manager and fitters. Macra na Feirme was set up in 1944 and aims to contribute to the sustainable development of rural communities in Ireland. It has recently set up a learning and training network called Macra Agricultural Skillnet. This government-supported initiative, which aims to promote all the further education opportunities available to those farming or working in agriculture, will be front and centre of the Macra stand at the event. McHale is a family run business that develops and manufactures specialist farm machinery, focusing on balers and bale wrappers. Over 90% of the machines produced are destined for the export market and McHale balers and bale wrappers can be seen working in 56 countries around the world. 250 people are employed in their headquarters in Mayo and the company will have 35 positions available for the Agri Careers Expo, including press break operators, welders, fitters, mechanical design engineers, quality engineers, electronic engineers, software developers, a human resource manager, product support engineers, market support engineers and five OEM Apprenticeships. SAP Landscapes is the largest landscape and ground maintenance contractor in Ireland. It services commercial, industrial, recreational and domestic customers. It also provides an integrated and efficient supply chain from producers and suppliers to their trade customers. SAP is based in Maynooth, Co Kildare, but has branches in Cork, Limerick and Galway, with a combined workforce of over 150 and in excess of 80 service vehicles. SAP is on the lookout for competent, professional and dedicated staff at the Expo. They are looking to recruit general operatives and forepersons based in Maynooth. Teagasc is the agriculture and food development authority in Ireland. Its mission is to support science-based innovation in the agri-food sector with the aim of improving profitability, competitiveness and sustainability. On the Knowlegde Transfer and operations side the list of current vacancies for Teagasc are a drystock adviser, a dairy adviser, poultry adviser, an education officer, a teacher, a financial accountant, an energy manager, a buildings specialist and administrators. There are also numerous research roles and up to 50 Walsh Fellowship positions. As Ireland’s largest university, UCD has something to offer everyone and is ranked within the top 1% of higher education institutions across the world. They provide a diverse mix of full- and part-time higher-level programmes. The UCD School of Agriculture and Food Science have provided the standout and dominant agriculture and food science programme in Ireland over the years giving graduates excellent employment opportunities right across the sector. University College Cork (UCC) launched a new level 8 agriculture science degree programme last year. The new course will be presented in conjunction with Teagasc Moorepark. The degree will be anchored in the School of Biological, Earth and Environmental Studies at UCC, and in the Animal and Grasslands Research Centre in Teagasc Moorepark. It will begin in September 2019. UCC will be also exhibiting and showcasing their broad spectrum of undergraduate and postgraduate courses available in the agricultural area, which also includes food science, agri-food and sustainable development. USIT is Ireland’s leading specialist in student travel, volunteer and work abroad programmes to the full range of products offered by any travel agent. USIT join the dots and put everything in place to ensure you have the best experience when travelling abroad. USIT will be looking to recruit candidates for its Canada Farm Programme. it has job openings in Canada, on all types of farms, varying from three months to a year-long contract. USIT has 15 job vacancies on Canadian farms. If you are interested in travelling, learning new farming skills, make sure to call into the USIT stand at the Agri Careers Expo. Zoetis is a global animal health company that delivers quality medicines and vaccines as well as support and education to veterinarians and livestock producers’ worldwide. It has a significant presence in Ireland with their commercial head office based in Cherrywood Business Park, Loughlinstown, Co Dublin. Zoetis is seeking to add 40 people to its team at the Expo in the following areas: safety, engineering, research and development, analytical science, quality assurance and control, customer support and administration. The jobs are based in Cherrywood, Tallaght and Rathdrum, with potential opportunities to travel abroad.